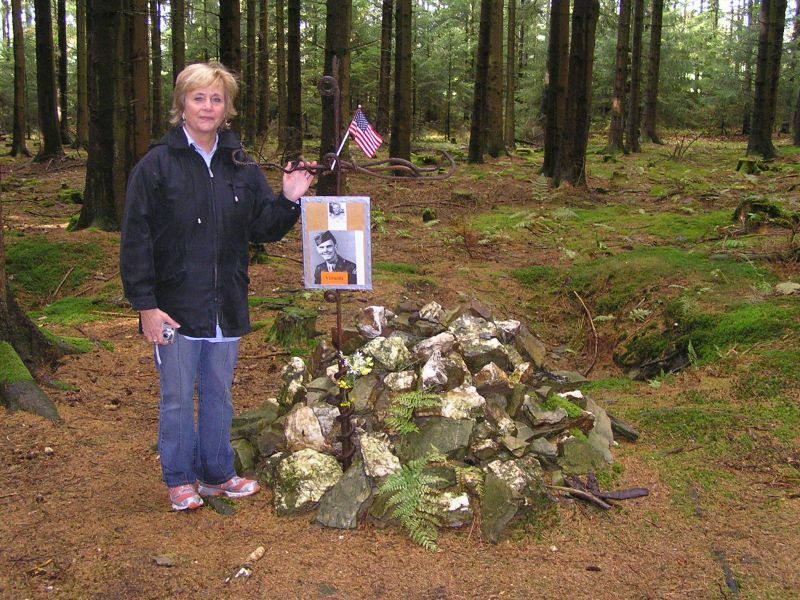 Nancy Fraker next to the improvised memorial for Walt Reuter and Raymond Blanton in the Hurtgen Forest. Nancy Fraker’s uncle, and both Gail Eisenhauer and Mary Lovell’s fathers have been in the Hurtgen Forest during World War 2. Frank Lovell, Mary’s father, survived the war and returned home. John Eisenhauer, Gail’s father, was killed in action in the Raffelsbrand area in September 1944, and Nancy’s uncle Raymond Blanton, went missing in action near the Raffelsbrand Junction as well. Nancy, Gail and Mary returned to Germany last year, in October 2011. Nancy Fraker kindly wrote down her thoughts of the trip for this website. I first visited Raffelsbrand, Germany where my uncle, Staff Sergeant Raymond Carlyle Blanton’s unit was last known to be, in May of 2008. During the week of October 2nd, 2011, I made a return trip with Gail Eisenhauer whose father John Eisenhauer was killed in action while serving with the 60th Infantry Regiment in September 1944. We were later joined by Mary Lovell, whose father Frank Lovell was also in the 9th Infantry Division, serving in the 60th Field Artillery Battalion and was stationed in the area. The main purpose of the trip was to present a 9th Infantry Division Memorial plaque to the Hurtgen Forest Museum, but the week was also filled with many other events. The Sons and Daughters Auxiliary of the 9th Infantry Division purchased a permanent Memorial Plaque honoring the many sacrifices of the 9th Infantry Division that were the first of nine divisions to bridge the Siegfried Line and the first to enter the Hurtgen Forest. Organizers of the event decided that this plaque should be presented at the closing wreath laying ceremony. I was most honored that Gail Eisenhauer asked me to make a short speech and present it to Manfred Klinkenberg of the Hurtgen Forest Museum where the plaque will hang. These ceremonies were quite moving. The church yard was dark and solemnly encircled with lit torches whose sparks blew everywhere in the windy drizzle, mist and fog during the wreath laying. At the exact time of the presentation and speech it began raining in sheets, however, through it shone the most amazing full moon. Surreal is the only word that I can think of to describe the mood. All were soaked to the skin in very cold temperatures throughout the ceremony. Mary said: “it was as if the rain was washing away the pain from the past”. A post-event gathering was held in a military tent several blocks from the church. I jokingly said that my knees were knocking so hard that I could almost hear them playing the Star Spangled Banner! 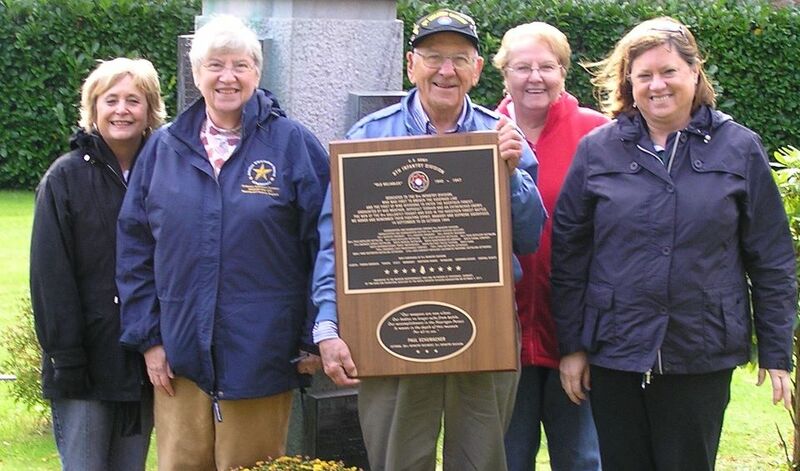 Nancy Fraker, Gail Eisenhauer, Paul Schumacher, a friend and Mary Lovell with the new 9th Infantry Division Memorial Plaque. Earlier in the week Gail and I visited three cemeteries. The one in the Ardennes, where Gail’s father is buried, then Henri Chapelle and also the Margraten Cemetery in the Netherlands where Carlyle is memorialized on the Wall of the Missing. A kind family from The Netherlands, Rob & Betty Jeggerings who adopted Carlyle’s name on the Wall arrived while we were inside the office at Margraten delivering a beautiful bouquet of flowers and poem which he had written to Carlyle. I was very moved by his many thoughtful gestures. They also drove a long way to Vossenack for the ceremony the next night and without knowing who I was, had held an umbrella over me as I waited to speak! 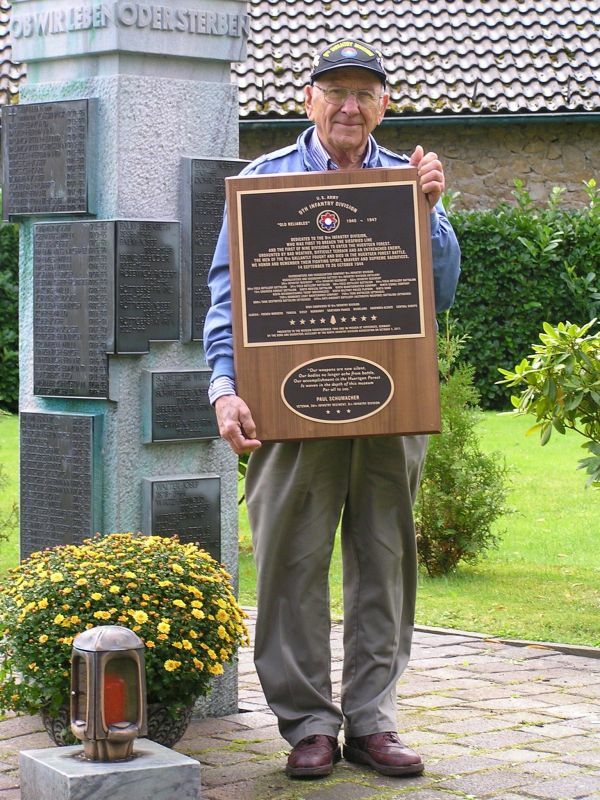 39th Infantry Regiment veteran Paul Schumacher holding the new Memorial Plaque for the 9th Infantry Division. The next morning, Manfred Klinkenberg who does a lot of work for the Hurtgen Forest Museum, drove us to the exact battlefield locations where Gail’s father and my uncle were lost. We picked wild flowers along the way, first placing them near where Gail’s father died, then driving a half mile to where we think Carlyle died. A new park with elevate rope climbing area was built at the edge of the forest since my 2008 visit. Before entering the battlefield, Mary, Gail and I held hands and asked our relatives to make the sun come out. Within a short time, beautiful shafts of sunlight filtered down in thorough the heavy forest and remained while we placed flowers at the rock monument to Private Walt Reuter, whose tags were found on that spot, and also is the same area where Carlyle was last seen. l took particular notice of the new digging which had taken place here since my last visit. The local forester pointed out where munitions were scheduled to be removed. He agreed to contact Manfred should artifacts or remains be found, which seemed quite likely. As we left, I gave a button containing Carlyle’s photo to the Forester. As we arrived back at the car the weather reverted to the fast moving Scandinavian cold front and to more pouring rain. 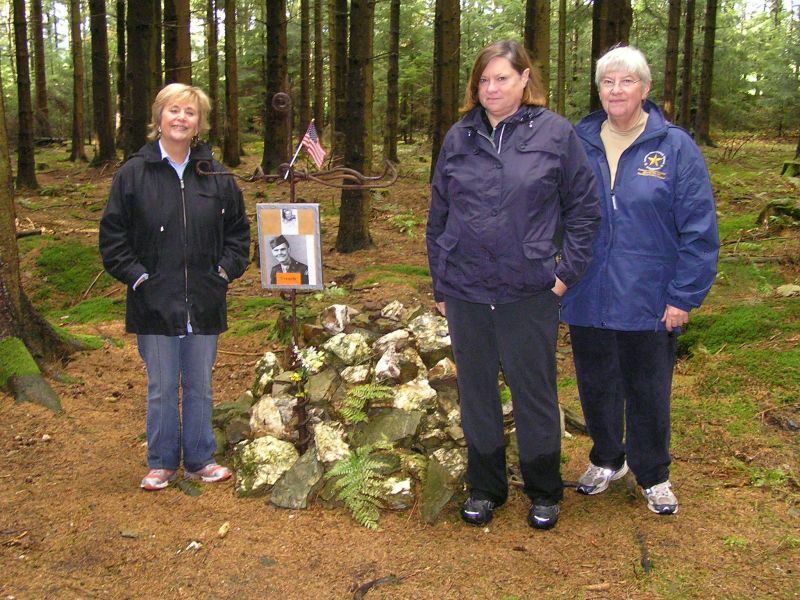 Mary, Gail and Nancy standing behind the memorial for Gail’s father, 2nd Lieutenant John C. Eisenhauer. 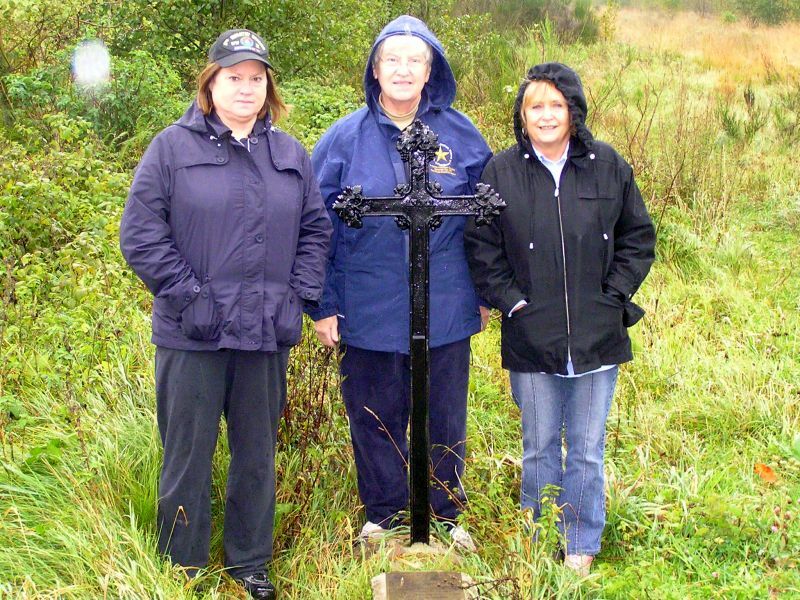 Nancy, Mary and Gail at the memorial for Walt Reuter and Raymond Carlyle Blanton, in the area where Carlyle went missing in action. On Saturday, Manfred drove us to a restored tank dedication two hours away at Liberty Park, in Overloon, The Netherlands. Mr. Hans Van Toer, a volunteer at the Hurtgen Forest Museum was part of the team who, over 2 years, had restored a Sherman tank to its former glory, in remembrance of those who liberated The Dutch people. There we also met with Stichting Missing In Action, a Dutch philanthropic group, who use high technology methods of searching for remains of men who went missing during World War 2. They showed Manfred a letter they’d received from German officials, stating that despite previous granted permissions, they must halt digging, due to community safety concerns of remaining munitions. Manfred responded that he chaired a committee of officials who will soon meet again to make a joint ruling- so this means that there is still hope that searching for Carlyle’s remains in this manner may yet proceed at a later time. I was then allowed to choose a few artifacts found in the area near where my uncle died – notably, a spent bullet embedded in wood. After a dinner with Manfred’s lovely family, he took us for a tour of a large Simonskall hospital bunker, located underneath what appeared to be a home. It was designed to look like a home to prevent aerial photographic identification. It was self contained, and stocked to sustain about 20 people over a long period, including a phone to Berlin and air recirculation in case of a gas attack, quite a feat of design and engineering for 1938. 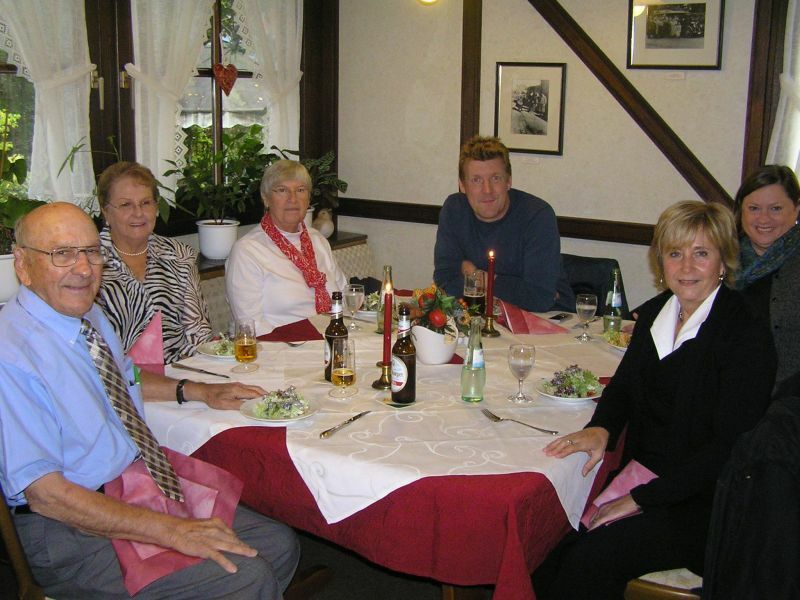 Dinner time at the hotel in Simonskall with Paul Schumacher, a friend, Gail, Manfred, Mary and Nancy. We stayed in a B&B located in Simonskall, a tiny 1600’s era village, located along the Kall River, in a valley just a mile or two from where Carlyle and John Eisenhauer died. Many homes and gardens remain exactly as they were built. High up, tucked into the mountainside was a little church where Gail and I lit candles for her father John and Carlyle. A cow peeked out at us from between some bushes when we departed, and Gail fed a horse an apple. So bucolic that you could almost hear Heidi calling out: “Grandfather!” Each morning goats with bells around their necks trotted down the hill as a neighbor fed them. While there, we had very limited internet, no cell phone, room phone nor newspaper. If one can be suspended in a time warp, it felt as if we were. I feel blessed and honored to have been part of the plaque dedication ceremony, spending time with Mary, Gail, and Paul, Manfred’s kindness in hosting us, and the many other kind gestures made to us. I can’t help but feel that Carlyle must have wanted me to have a sense of some of what he experienced on the week of his passing. The war time picture we have of Carlyle in uniform was taken while he was training with the 42nd Infantry Division, also known as the “Rainbow Division”. A huge rainbow bridged the highway to the airport, and on arrival allowed us the rare experience of driving through it.